Whichever way you drive along State Highway 1 to Waikawa Beach Road you must cross one of the two streams that feed into our river. A tad south of The Greenery garden centre you cross the Waiauti Stream, fed by two or more streams that flow down through farmland from the foothills behind South Manakau. 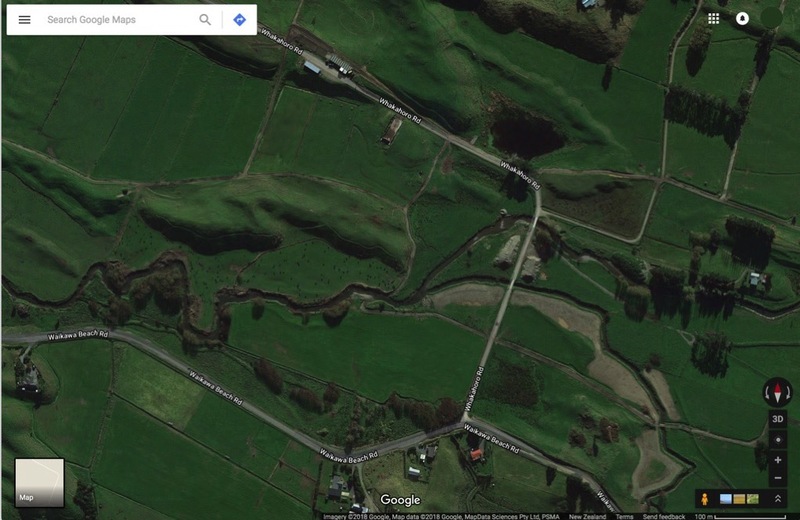 If you're driving south then you cross the Waikawa Stream, sourced in the foothills behind North Manakau. Before it flows under the road it passes through Waikawa Reserve, a popular camping spot. These streams come together just west of Whakahoro Road (west of Takapu Road) and flow as one down to our footbridge in the village and then out to sea. Waikawa streams merge west of Takapu Road. I've discovered all this by studying Google maps. If you have better information, feel free to share. The river at the footbridge and below has long been a popular spot for swimming, kayaking, paddling and general cooling off on a hot summer's day. 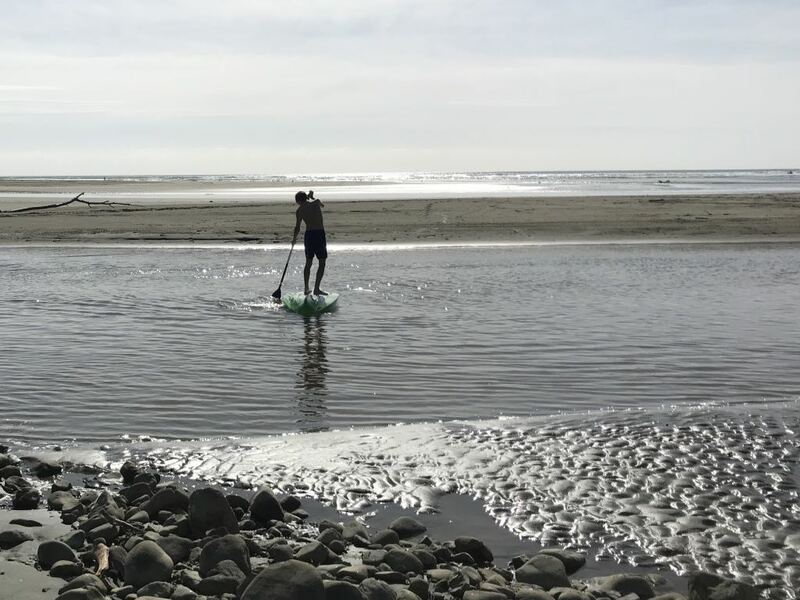 Paddleboarding on a hot day. But in recent years regular summer water quality testing by Horizons Regional Council has made it clear that's a somewhat risky thing to do. The quality of the water in our river is definitely not what it should be or what we want it to be. 3 years water quality monitoring results. Look at all that red and orange! What we want is green all the time. Of course, sadly, we're not alone. Rivers all around New Zealand are polluted. 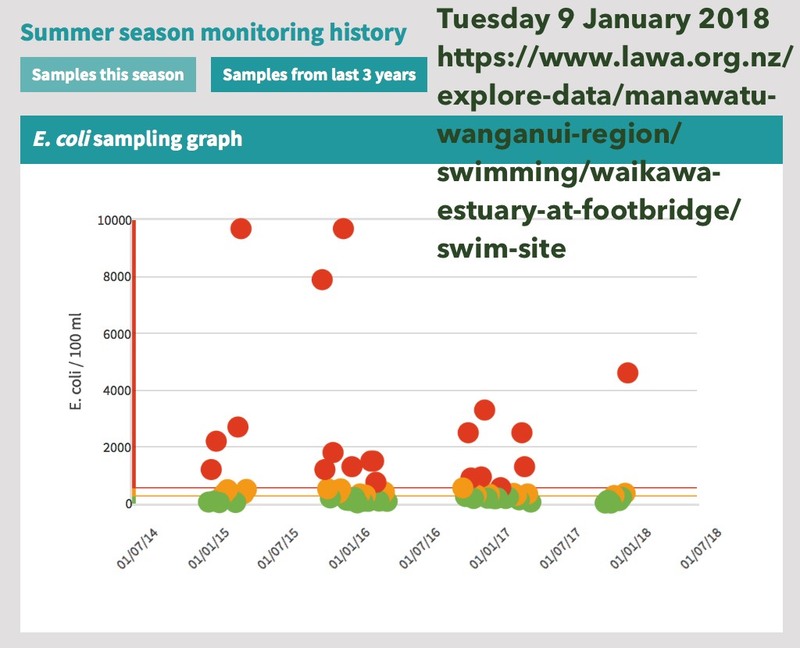 But the folks by the Hutt River are doing something about their toxic algae problem, as NIWA explains: Summer Series 2017 — Citizen scientists take on Hutt River. … a small group of citizen scientists [who will] wade into the river every Monday around noon for the next few months to look at rocks, measure water temperature and visual clarity, collect a water sample for E. coli testing and count the amount of rubbish. At the beginning of summer, supported by GWRC environmental monitoring staff, Dr Valois shows the group how to take the measurements, helping them set up the equipment and encouraging them as they grapple with unfamiliar equipment. She has a particular interest in citizen science and wants to support people to determine if waterways are healthy enough to swim in. Over the past few months defining “swimmability” has proved difficult. But Dr Valois is determined to make it easier to understand. I think that's very inspiring! Isn't it something that could happen here too? Anyone like to step up and be an organiser? How about it, beach lovers?